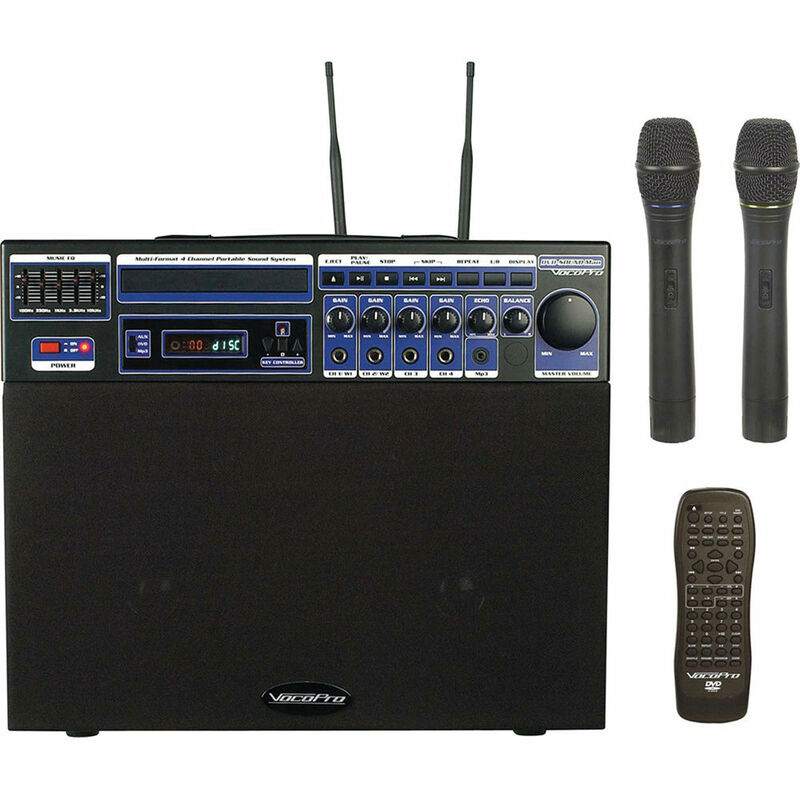 The VocoPro DVD-Soundman 1 Multi-Format Portable Sound System is compact, powerful and delivers all the features suitable for general audio PA, presentations, karaoke, background music, instruction and more. The DVD-Soundman 1 is completely self contained with 80 watts of power and a full range speaker system to address audiences both large and small. Built in VHF wireless receivers allow for simultaneous operation of the 2 wireless handheld microphones (included). The DVD-Soundman 1 also features a multi-format disc player capable of DVD, CD, CD+G, MP3-CD and photo CD formats. A 1/8" (3.5mm) mini input connects portable MP3 players, and NTSC/PAL compatible video outputs allow you to connect the DVD-Soundman 1 to displays. Additional features include a 5-band EQ, digital key control AUX and Stereo (Mixed) outputs. Box Dimensions (LxWxH) 26.3 x 21.5 x 16.0"
DVD-Soundman 1 Multi-Format Portable Sound System is rated 5.0 out of 5 by 1. Rated 5 out of 5 by AV Master from Great Find This was truly a great find. Being in a large school district, I get many requests for portable PA Systems. It is worth the money.